In Bondurant, just northeast of Des Moines, half a dozen homes suffered devastating tornado damage. Roofs were torn off, large trees uprooted, and debris everywhere. 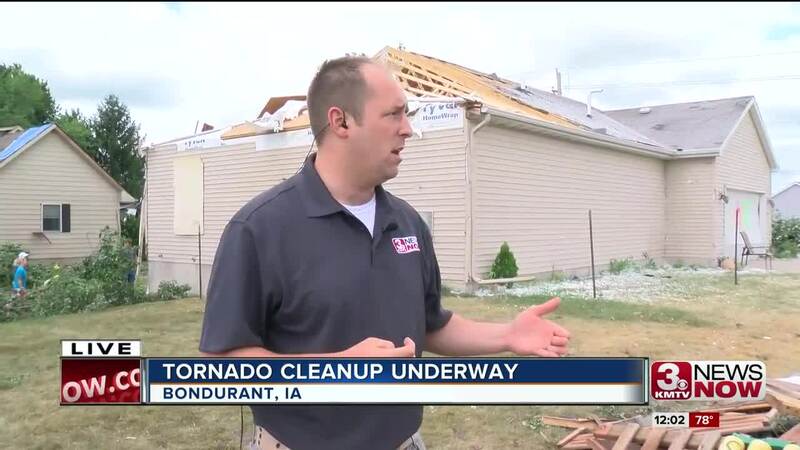 With 27 reports of tornadoes across Iowa on Thursday, clean-up efforts were underway Friday in areas of Central Iowa torn apart by tornadoes the night before . At least 17 people were hurt as tornadoes flattened homes and chucked cars in all directions. In Bondurant, just northeast of Des Moines, half a dozen homes suffered devastating tornado damage. Roofs were torn off, large trees uprooted, and debris was scattered everywhere. 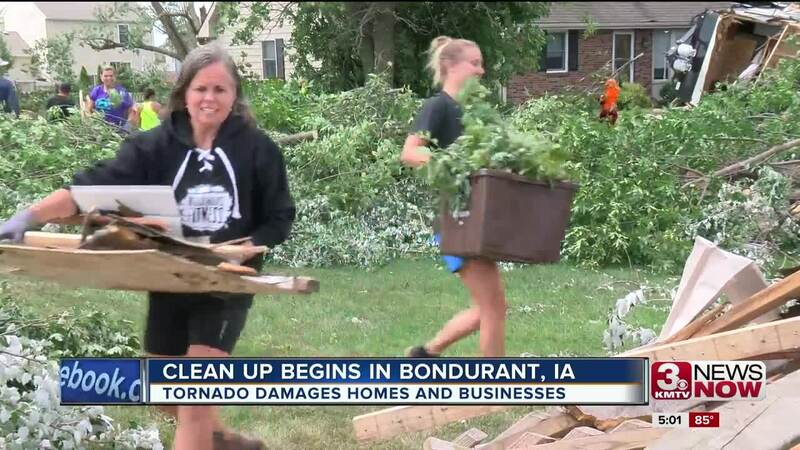 The National Weather Service in Des Moines said Friday that the tornado that hit in Bondurant rated an EF-2 with peak winds reaching 110 mph . EF-2 tornados are categorized as strong, with winds between 100 and 135 mph. Fire and police did wellness checks at impacted homes. Bondurant Mayor Curt Sullivan said no one was injured. Around 11 a.m. Friday, Gov. Kim Reynolds toured the area. More than 100 volunteers from local churches, the gym, and high school sports teams helped with clean-up efforts. It was the second major weather-related issue there this summer after part of the area suffered from flooding earlier in the year. "Thankful that it's not me, obviously, it's so sad, and they'll recover, but very blessed because I'm OK, and so I can give back because I am," volunteer Jessie Schrock said. "It's hard to watch everybody have so many troubles, so it's great to see people who don't, be able to come out and help when they can." To help aid the storm cleanup, the Salvation Army is seeking donations of new work gloves . Addison Grosc, 12, of Bondurant said she was home alone when the tornado sirens went off Thursday. "So then I looked outside, and there was one almost in our backyard already, and so I sprinted downstairs with my dog," she said. Her mother rushed home, and they took shelter in the basement. "I was pretty much terrified," Addison said. "I didn't really know what to expect from this. When we were downstairs, it made the whole house shake and rattle, and it felt like we were in some kind of weird earthquake." Addison's mom, Beth, said their house will need a new roof, windows, and outdoor items, but they're glad to hear no one was killed or seriously injured. "Really, you just look around and thank God," she said. "It could've been a lot worse." In Pella, an EF-3 tornado with winds reaching 144 mph left 10 people injured. 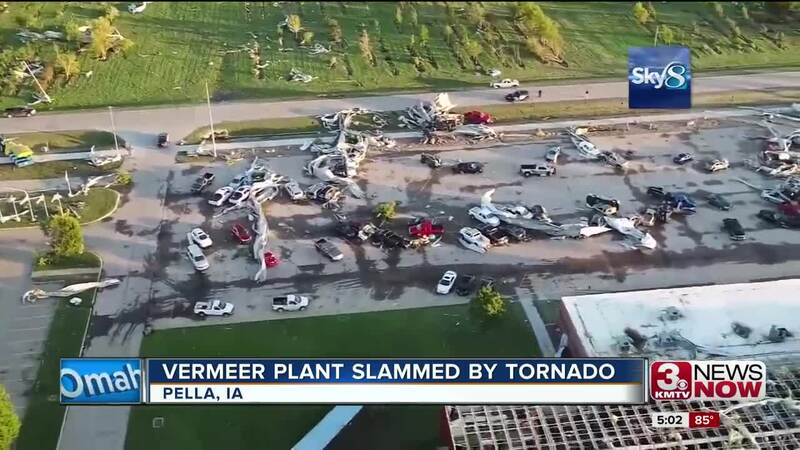 At the Vermeer manufacturing plant , which makes industrial and ag equipment, metal from the building was thrown about and cars ended up piled on top of one another in the parking lot. The company was holding a customer appreciation event at the time, with as many as 400 customers from all over the world there when the tornado hit.